As we discussed yesterday, a storm system moving through late Thursday into Friday should “mix up” the atmosphere a bit along the front range today. 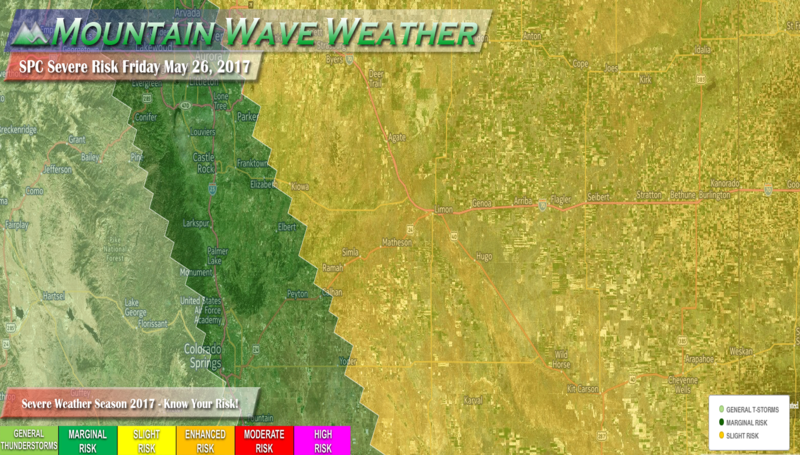 The categorical outlook has most of Eastern and Northeastern Colorado in a yellow shaded “slight” risk. This means that area will have the best chance of seeing severe storms form. Closer to the mountains and foothills, marginal and general thunderstorm risks exist. The primary threats from storms today will be hail and wind… due to terrain and wind profiles we can’t ignore the small chance for a weak tornado or two, so keep an eye out! Again, not a widespread threat of severe weather today, you have better chances of not seeing severe weather than you do. That being said, any areas in the risk area have a chance of seeing a severe storm, that’s what we try to get folks prepared for! We’ll keep an eye on things this afternoon and pass along any updates!